For many past Valentines days I would say the same thing concerning the matter: that the entire day/idea/theme was dumb and over-rated. Another one of those over-commercialized holidays: yet another way to spend lots of money (crazy-high prices for roses and chocolates) and a way to “force” people to tell others that someone cared about them. As Valentines days came and went, I realized I can’t put all my happiness into one day being “perfect”. 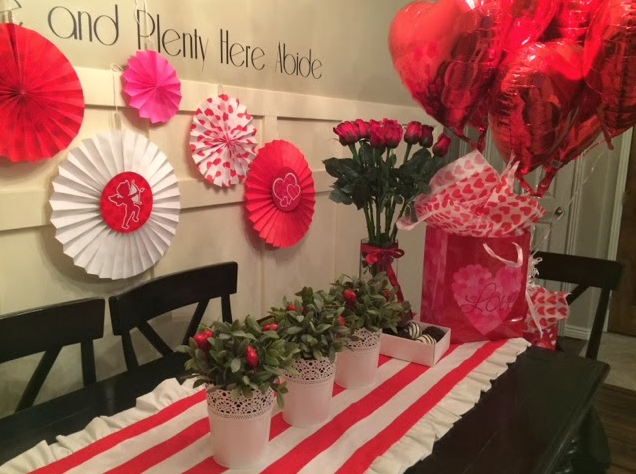 Sure, it’s fun to be in love and to decorate for Valentine’s Day. But when I truly think about it, my husband and daughter show me they love me every day by serving me, hugging and loving me on a daily basis. And now, because this one day isn’t perfect none of that counts!? In my opinion, thats not very fair to them. Here’s my new motto when it comes to holidays: I can go as over-the-top and crazy as I want to, if I feel up to it that year (or holiday) or as the budget permits. If I don’t feel up to it, I am not putting any more stress on my husband’s plate by adding my crazy expectations. There’s no way it would ever be EXACTLY how I would do it, because he’s not me. I am really okay with my new motto and at the end of the day I’m the one who likes holidays my way. My husband and daughter would be happy with anything! You’ve described my weight and diet situation to the “T”! I love juicing and love the Paleo/Clean eating lifestyle! I plan to do another juice fast in a few weeks because I need to get all of these chocolate covered Strawberries out of my system 🙂 Good luck to you in your endeavors! I know that hard work in the health and lifestyle department always pays off!